Unlock your Doro legally and permanently. The recommended method by the phone manufacturer. 100% online; your Doro never has to leave your side. How to unlock my Doro phone with doctorSIM? You can unlock your Doro in three simple steps. Once you've requested an unlock code for your Doro through doctorSIM, we'll send you simple step-by-step instructions on how to finalize the process. Power on your phone, type in the network unlock code you received via e-mail and your Doro will be unlocked forever. That's all there is to it! How do I obtain the IMEI number of my Doro phone? The IMEI number is a 15-digit code which you can obtain by dialing *#06# on your Doro's keypad. If you see 17 digits, just send us the first 15. Do I need a SIM card from a network different to the one a Doro phone is locked to? Yes. 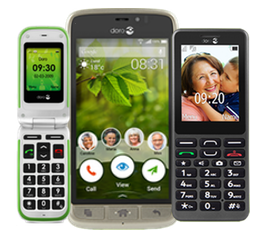 One of the requirements to unlock a Doro cell phone is to have a second SIM card to hand belonging to a different carrier. Without this SIM card, the phone will not prompt for the unlock code and it won't be possible to unlock the phone. You can borrow one from a friend or family member if necessary, as completing the unlock process only takes a couple of minutes. How many unlocking attempts does my Doro phone have? You have a maximum of 10 attempts to enter the correct unlock code. If you have run out of unlocking attempts, you will not be able to unlock your phone. This is why it is very important that you request an unlock code through a reputable phone unlocking company offering you total guarantees. Avoid free unlock codes and untrustworthy online providers because they could easily damage your Doro. How do I find out to which network provider my Doro phone is locked? In order to unlock your Doro, it is very important that you select the original network provider your phone is locked to. Unfortunately, we cannot cancel or issue refunds for unlocking requests if you select the incorrect original carrier. What happens if I have a fixed-term contract with my network provider? You can unlock your Doro phone even if you have signed a fixed-term contract with your network provider. You will still have to pay your monthly bills until the contract expires (or pay an early cancellation fee), but at the same time, you'll be able to use your phone with other carriers. If you stop paying your monthly bills, your network provider will blacklist your Doro and it won't work properly on any carrier in the country of origin of the original operator. How do I remove my Doro phone from the blacklist? Unfortunately, doctorSIM's phone unlocking services cannot remove a phone from the blacklist. The owner of the phone will need to contact the carrier that reported the phone to resolve the issue. Yes. Unlocking your phone with doctorSIM is permanent. You can also restore your phone to factory settings and download all official software updates without fear of your Doro locking again. Use your Doro phone with any network carrier in the world. Your Doro phone's warranty remains intact. Fast unlock code turnaround (within minutes to several business days). Easy-to-follow instructions delivered 24 hours a day, 365 days a year.